The yen is definitely in flux, is the Japanese currency at the beginning of one of its periodic walkabouts? In the early hours of this morning, we have already seen a 120 point range against the dollar, and it seems that nerves are still very twitchy on any kind of rumour or news. Since 2007, the USD/JPY market has seen a 40% range, outdoing even sterling's recent collapse. And this has been against a backdrop of virtually no growth, a drift into huge trade deficits and an appalling debt pile. The rise of the yen over the last few years has seemed contrary to all common sense, so perhaps the rubber band has stretched too far and the 'snap back' has started. 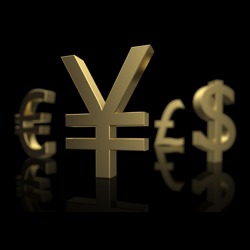 Pull backs on the recent yen weakness have proved to be very short-term and limited in scope. In conversation with Financial Spreads' clients, we are seeing an increasing wish to sell the yen but 'only if' we get a correction, allowing them in at a better price. Unfortunately, as many readers will know, 'waiting for better prices' is often done in vain. Support for the USD/JPY market is at current levels of ¥89.00/05 and then below here at ¥88.37/45. On the upside, resistance is at ¥89.28/35 and ¥90.00/15.